Categories: Whisky Distillery / Brand, Fettercairn (Old), Region, Scotland, Highland, Fettercairn (Old), Age, No Age Statement, Price, $100 to $150. 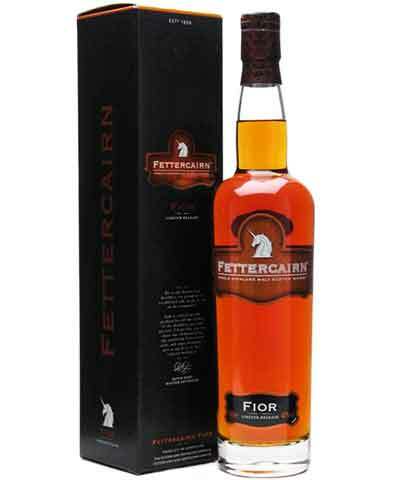 “Fior” means pure or true in Gaelic, and this, no age statement bottling launched in summer 2010, is something of a rebirth for the Fettercairn distillery. Fior contains 15 percent heavily peated whisky matured in first fill ex-bourbon barrels, along with a proportion of 14 and 15 year old spirit. The result is a bold and complex whisky with real nose presence, smoke, sherry, toffee, vanilla, and oranges merge on the nose, while the palate showcases more smoke and toffee, plus spices, oak, and licorice in the lengthy finish. “Honey gold in colour, with aromas of crushed pear, toffee apple and hints of cinnamon and vanilla. A kiss of peat smoke with hazelnuts, orange rind, ginger and coriander complete the nose. COLOUR : Warm and inviting honey gold. NOSE : Rich and enticing. Bold Highland nuances of crushed pear and toffee apple with intriguing spicy notes of cinnamon, vanilla and gooseberries draw you in. Then a veil of tangy peat smoke, freshly baked bread and hazelnuts suddenly emerge, but is quickly tempered by orange rind, ginger and coriander. TASTE : Bold and positive. Mysterious, complex and heart warming with its many attractive flavours of dark bitter chocolate, rich roasted coffee beans, citrus fruits and truffles. Each flavour combines in perfect harmony, then a charming ‘spritzig’ or prickle on the tongue of peat smoke, nutmeg and fresh mint arouse the senses. Rather intriguing but delightfully different. By holding this delectable malt long in the mouth you will capture the last remaining whispers of sherry trifle,marizpan and ripe pineapple. Single malt at its purest.